KwikBeet is produced using a unique cooking process and offers all the benefits of traditional sugar beet without the inconvenience of long soaking items. 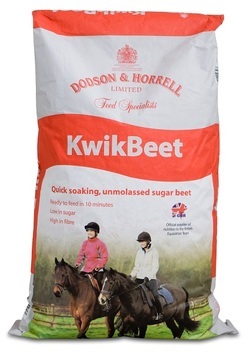 KwikBeet offers a quick and convenient way of adding sugar beet to your horse's diet. The rapid soaking flakes are ready to feed in 10 minutes, providing extra succulence in your horse's diet. For horses that have difficulty chewing hay or haylage KwikBeet can be used as a partial forage replacer, providing slow releasing energy from digestible fibre. KwikBeet is unmolassed and is suitable for horses and ponies at risk from laminitis. A complementary feeding stuff for equine. KwikBeet can be fed as a palatable addition to the normal concentrate feed and should be fed along with other sources of forage. Add 1 litre of water for every 100g (dry weight) of KwikBeet. After soaking for 10 minutes, mix with normal feed. Feed 100g/100kg bodyweight per day to horses and ponies as an addition to concentrate feed. For example, feed a 300kg Pony 0.3kg per day and feed a 500kg Horse 0.5kg per day. KwikBeet should be weighed before soaking. For every 100g of KwikBeet, add 500ml water and soak for 10 minutes before feeding.